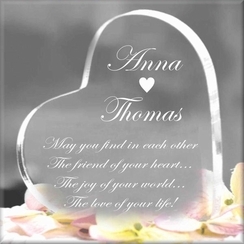 Each clear acrylic topper is shaped like a heart on its side and features an engraved double heart design with your choice of two first names and a wedding (anniversary) date, or your personal massage. Commemorate that special occasion forever with our Laser Engraved Heart Keepsakes. Transform this crystal decoration by adding your own custom text and picture. Beautiful laser engraved pictures and text have a magnificent look that is sure to put a smile on their face. It is a unique gift that is guaranteed to last generations. The laser engraving will show a crisp white with the clear acrylic for an elegant high contrast. You can use this piece for a paperweight, a decoration or as a cake topper keepsake for weddings, anniversaries, birthdays, retirements or any special occasion.